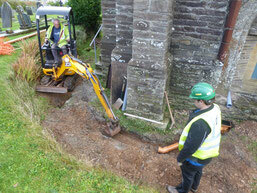 A contractor has been digging a trench and soakaway to take the rainwater which is now being piped down from the roof. Although this was not a recognised area for burials, an archeologist was on hand to recover any bone fragments so that they could be re-interred elsewhere in the churchyard. A major milestone in the project when the Bishop of Plymouth, the Rt Rev Nick McKinnel, came to a service at St Peter's and rededicated the rehung bells. See NEWS for more details. Clock is now fully installed. The face as been re-hung on the tower looking splendid after its repainting. 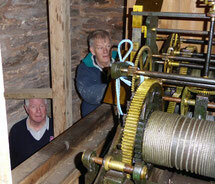 The chimes and strike are also working to let the village know about the passage of time. Cumbria Clock Co have now reinstalled the clock in the tower and set it to work, complete with its electric auto-winding system. Unfortunately, unforeseen delays mean that the face and striking mechanism will not be operational until w/c 5 September. Re-hanging of bells now complete. 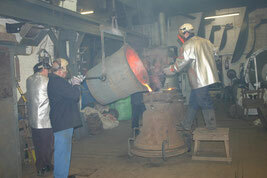 Our bell-hanger Neil from Whitechapel Bell Foundry has completed his work for us and departed. The last few pieces in the jigsaw are coming together. 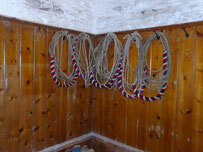 The home team have made 2 new rope chutes, repaired the old ones and fitted them. 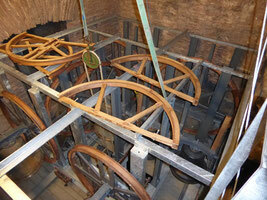 The new ropes have been attached to the wheels and adjusted for length and the bells are ready for ringing. See News. 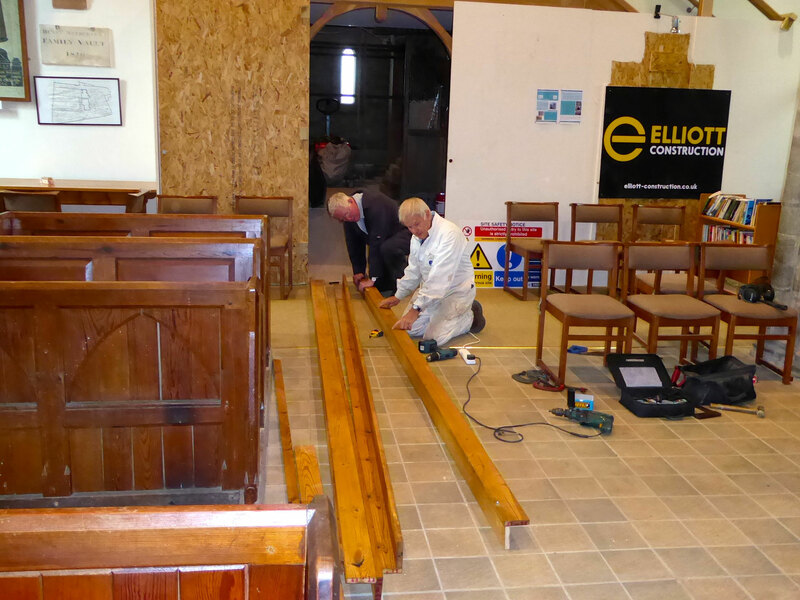 The Ellacombe chimes still need to be connected, after which all we need is the clock (which is scheduled to return on Monday 22 August), a bit of decorating and a good clean up. 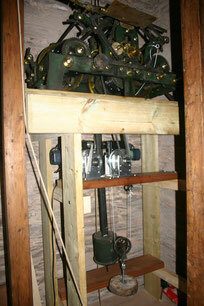 After a busy week's work the frame has been installed, all 8 bells hung and most of the wheels fitted. Nothing is left on the ground floor of the church - all the "bits" are in the belfry in various stages of completion. Next week will be setting up and adjustments, but we're almost there! Thanks to Neil, Peter and Ian from Whitechapel Bell Foundry for their hard work. 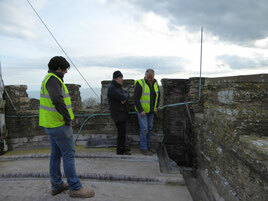 The volunteers have fitted "Galebreaker" to cover the inside of the louvres in the belfry. 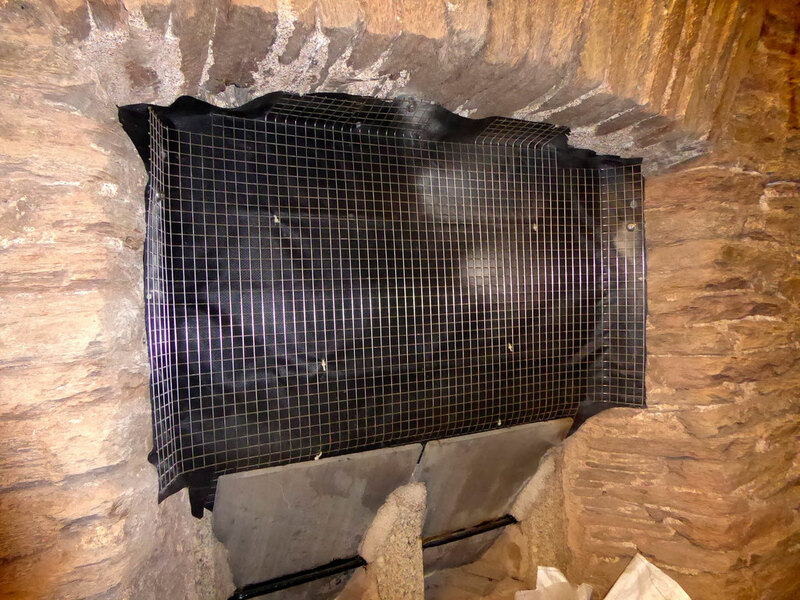 This should help to keep out the damp, while still allowing air to circulate. Advertised for farm buildings as "Good weather protection and ventilation for farm livestock buildings is essential to maintain a healthy environment for livestock" - it should be perfect for our new bells and frame. 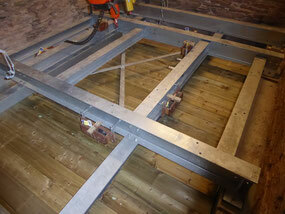 Elliott Construction have now completed the installation of new floorboards in the belfry. These are resting on the bottom flanges of the foundation girders and can be removed to allow the bells to be hoisted into the new frame when it arrives. The photograph also shows some of the pulley blocks on the girders; these will guide the bell ropes down to the ringing chamber. 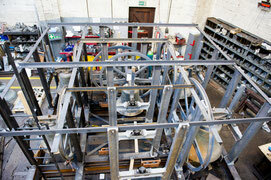 The new bell-frame has now been erected at the Whitechapel Bell Foundry workshop. 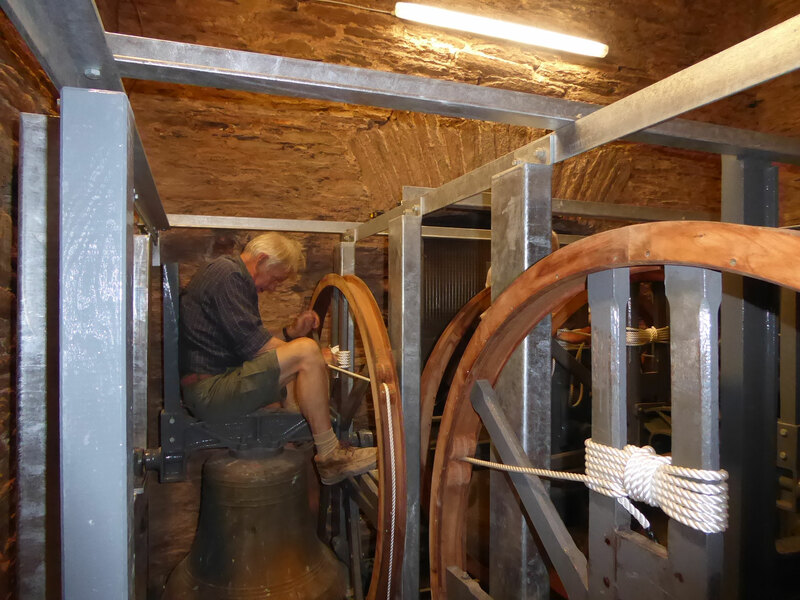 Our 6 old bells have been fitted so that the craftsmen can make sure that everything fits together correctly before it is dismantled and moved to Stoke Fleming. This structure will rest on top of the foundation girders installed this week. 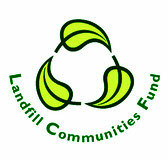 A grant for the new bell-frame has been given by Viridor Credits from the Landfill Communities Fund. The foundation girders for the new bell-frame arrived this week, and bellhangers, Neil and Peter from Whitechapel Bell Foundry, have completed installing them on the concrete ring beam, assisted by local volunteers from the bellringing team. For more photos see Gallery. 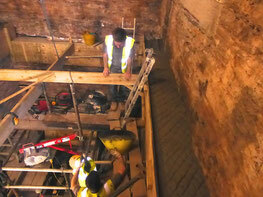 Elliott Construction have now completed the construction of the concrete ring beam in the bell chamber. This will provide support for the foundation girders of the new bell-frame, and also help to strengthen the tower structure. Neil from Whitechapel Bell Foundry came to start removing the bells and bellframe, with help from John, Peter and Richard. At the end of the day the tenor, 5th, treble and 2nd bells were on the ground floor of the church; three of them in the aisle but the tenor was still in the Choir Vestry waiting for the partition to be removed to allow it to be brought out. 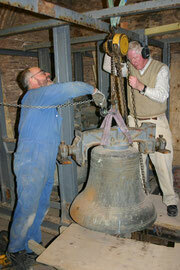 Click here for more pictures of the bell removal. At the end of another week. 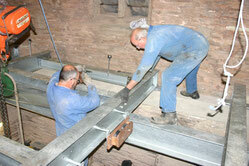 Elliott Construction have removed all the old, corroded roof girders and installed 3 new galvanised ones. Note the beetle damage in the original (13th century?) oak beams. The bell-hangers will use these to lower the bells down through the tower. Information board erected at the church gates by volunteers, to explain to passers-by what is going on. This week the scaffolders have erected scaffolding right up to the roof, and supported the original oak roof beams in preparation for removing and replacing the corroded steel ones. See Gallery for pictures. 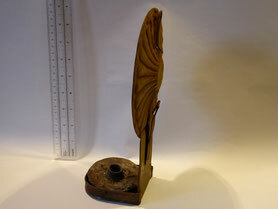 Meanwhile a candle holder, perhaps" Victorian, was found in the clock chamber. Was this the one our "Lightning Man" dropped when he fell down his ladder? Click here for details of this story. Good progress by Elliott Construction this week. 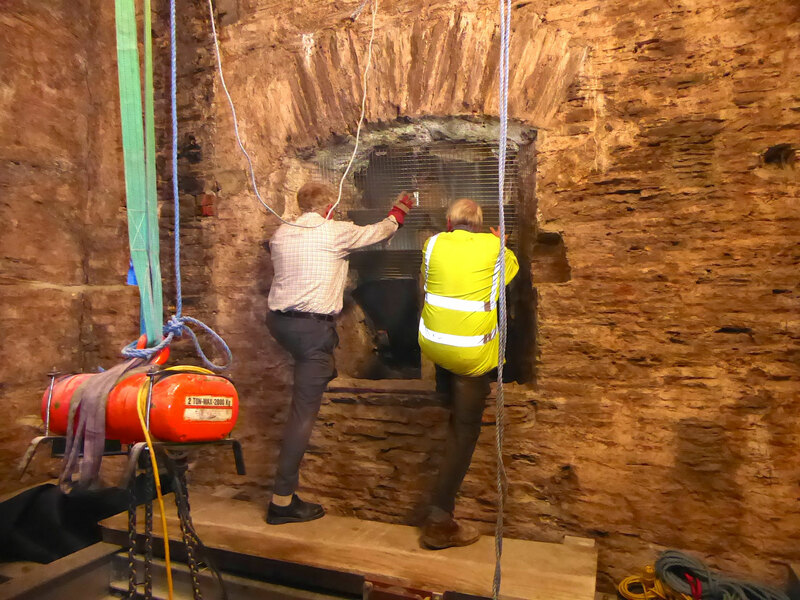 We now have a new Ringing Chamber floor, complete with trapdoor, and scaffolding up to the Ringing Chamber ceiling. 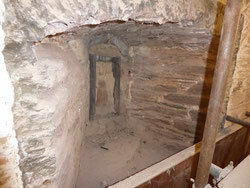 The top half of the redundant chimney has been removed, as has the clock weight-box. The builders have now cut trapdoors in the first 2 ceilings, and removed the bottom section of the clock weights chute and the old clock platform. They found another "time capsule" under the ringing chamber floor. 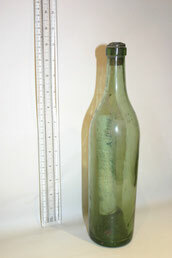 Two previous bottles were found last year and were taken to Exeter Museum for assistance with opening. Click here for more information. A group of Stoke Fleming Bellringers travelled to London to visit Whitechapel Bell Foundry to watch our two new bells being cast. They were generously sponsored by Johnson Matthey (International metallurgists) to commemorate their bi-centenary and in memory of founder Percival Norton Johnson who lived in Stoke Fleming and is buried in our church. 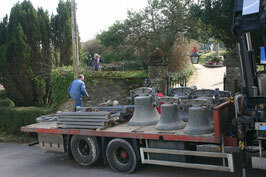 These new bells will be added to our current 6 to make a peal of 8. Some photographs of the visit can be seen in the Gallery. Building work started in earnest today, with Elliott Construction. 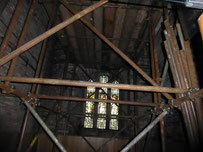 There is now scaffolding in the choir vestry and the Tower Room. 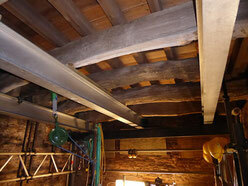 The "home team have removed the bell ropes, and the seating and some of the panelling from the ringing chamber. Upstairs in the clock chamber they have also dismantled the rope chutes which guided the ropes from the bells to the ringing chamber. The "home team" removed the wooden box housing the tower clock in preparation for the dismantling and removal of the clock on 18-19 January. 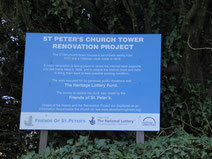 A cheque for £7,000 was presented by Friends of St Peter's to pay the deposit for the work on the clock. This is expected to start in mid-January when the clock will be taken away. Its chimes will be silent from then until the end of the project in the Autumn. The electrician started work today to install improved lighting on the tower stairs and in the ringing, clock and bell chambers. He is also upgrading the wiring to modern standards and providing a power supply for the clock electric auto-winding system. The paper copy of the Faculty permission from the diocese was received today, so work can now start as planned. 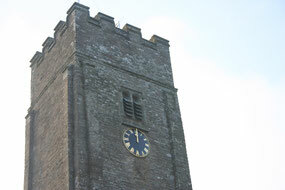 We expect the clock to be removed in late January, with building work starting in early February. The clock and bells will be silent throughout the duration of the project, which is expected to be about 6 months. 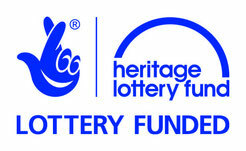 The first tranche of the grant from HLF has been received. An order has been placed with Whitechapel Bell Foundry and a deposit paid. They expect to start work on removing the bells and bell frame in April 2016. We have today received "Permission to Start" from the Heritage Lottery Fund which means that we will shortly receive the first installment of £19,900 of their grant. We will be able to place orders once Faculty is received from the diocese, which should be very soon. The PCC have approved Contractors to do the work (builder, bell hanger and clock specialist) and as soon as we have the Faculty orders will be placed. We expect work to start in early February. 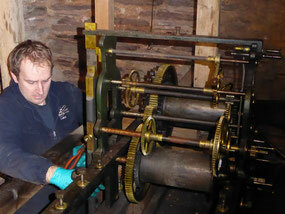 The tower clock will be stopped and silent from late January until autumn next year while the work is going on. The bells will be out of action for most of that time as well. 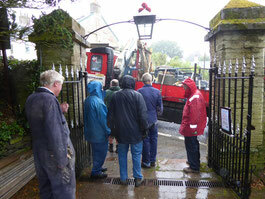 Unfortunately, the builders' estimates have come in rather higher than expected, so we are still fundraising. See Fundraising and How to Donate. All contributions are welcome. There has been considerable progress on the preparation for the Tower Renovation Project, and we hope it won’t be long before the work starts. The Diocesan Advisory Committee (DAC) have approved the works and we are almost at the end of statutory period of public consultation. Formal award of the Faculty (diocesan “planning permission”) will follow.